Filippo graduated from University of Bari, Italy, in 2001. He moved to UK in 2003 and worked at the PDSA before joining the Royal Veterinary College in 2006 as Resident in Veterinary Dermatology. He gained the RCVS Certificate in Veterinary Dermatology in 2009 and became a Diplomate of the European College of Veterinary Dermatology in 2010. Filippo has special interests in ear diseases and allergies; he strives to establish a referral service where patients receive individually tailored treatment programs and where cases benefit from a multi-disciplinary approach to achieve the best possible outcome. 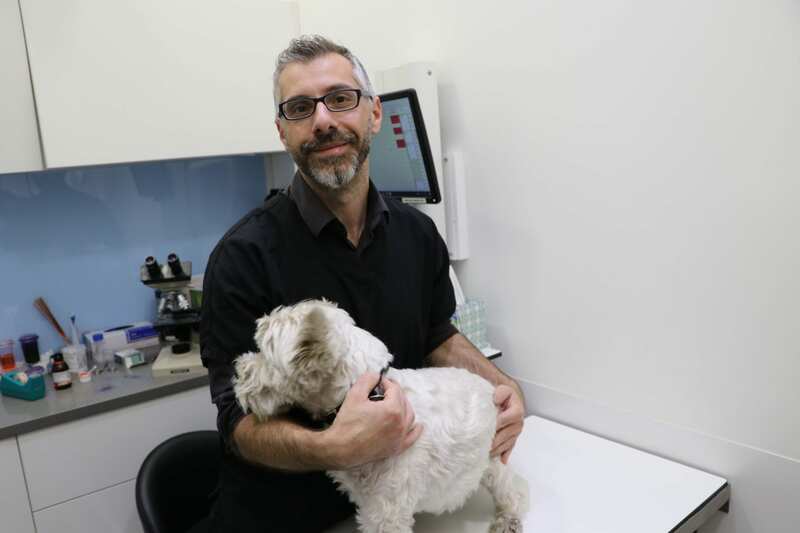 Filippo is also an Honorary Lecturer in Veterinary Dermatology, and is a member of the British College of Veterinary Specialists and President of the British Veterinary Dermatology Study Group. Computed tomographic findings in 12 cases of canine multi-centric lymphoma with splenic and hepatic involvement. I.D.Jones, A.D.Daniels, A.Lara-Garcia, L.M.Peters, P.Mantis. Journal of Small Animal Practice 2017; 58, 622-628. Associations between dual phase computed tomographic features and histopathological diagnosis in 52 dogs with hepatic or splenic masses. I.D. Jones, C. R. Lamb, R. Drees, S. Priestnell, P. Mantis. Veterinary Radiology and Ultrasound 2016; 57, 144-153. Ultrasonographic measurement of flow mediated dilation in dogs with chronic valvular disease. I.D. Jones, V.Luis Fuentes, A. Boswood, M. Hezzell, D. Wrigglesworth, W. Moonarmart, J. Elliott. Journal of Veterinary Cardiology 2012; 14, 203-210. Comparison of flow mediated vasodilation in femoral and brachial arteries in healthy dogs. I.D. Jones, V. Luis Fuentes, D. Wrigglesworth, E. Mort, J. Elliott. American Journal of Veterinary Research 2011; 72, 1029-37. Evaluation of a flow-mediated vasodilation measurement technique in healthy dogs. I.D. Jones, V. Luis Fuentes, T. Fray, C. Vallance, J. Elliott. American Journal of Veterinary Research 2010; 71, 154-61. In vitro comparison of bacterial contamination of peripheral intravenous catheter connectors. I.D. Jones, A.M. Case, K.B. Stevens, A. Boag, A.N. Rycroft. Veterinary Record 2009; 164, 556-57. Factors contributing to the contamination of peripheral intravenous catheters in dogs and cats. Veterinary Record 2009; 164, 616-18. What is your diagnosis? Large airway neoplasia (undifferentiated sarcoma) resulting in obstruction of the distal trachea. Journal of Small Animal Practice 2007; 48, 177-9. Ultrasound-guided thoracic paravertebral block: cadaveric study in foxes (Vulpes vulpes). P. Monticelli, I.D.Jones, J Viscasillas. Veterinary Anaesthesia and Analgesia 2017; 44, 968-972. 2016, Grupo Asis Biomedia, Zaragoza, Spain. Associations between respiratory signs and abnormalities reported in thoracic CT scans of cats. Journal of Small Animal Practice 2016; 5, 561-567. Computed tomographic findings in 57 cats with primary pulmonary neoplasia. S. Aarsvold, J.A. Reetz, J.K. Reichle, I.D. Jones, C.R. Lamb, M.G. Evola, M. A. Keyerleber, T. Drost, R. Kramer, A.J. Marolf, D.S. Gibbons, T.L. McKlveen. Veterinary Radiology and Ultrasound 2015; 56, 272-277. E.J.T. Finding, I.D. Jones, V. Luis Fuentes, N.J. Menzies-Gow. American Journal of Veterinary Research 2012; 73, 755-61. Flow mediated vasodilation measurements in Cavalier King Charles Spaniels with increasing severity of myxomatous mitral valve disease. S.G. Moesgaard, C. Klostergaard, N.E. Zois, T. Teerlink, M. Molin, T. Falk, C.E. Rasmussen, V. Luis Fuentes, I.D. Jones, L.H. Olsen. Journal of Veterinary Internal Medicine 2012; 26, 61-8.